I recently had the opportunity to speak with Jerry Pawluk, President of Safeplast NA, a manufacturer of hose guards and sleeves. The oil and gas sector is a big one for the company, and Pawluk said the company has seen a big uptake in the sector over the past few months. In fact, the company has really been getting the word out on the need for these types of products—over 10 years in business, they have had growth every single year. 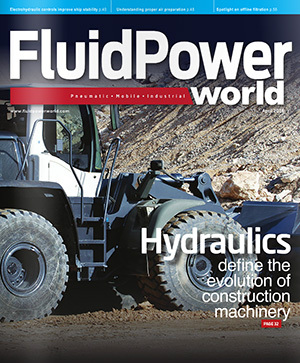 We discussed why safety is so important when you’re working with high pressure hydraulics. “There are various reasons for focusing on hose safety. Employee safety is number one, but then also for equipment safety. Hydraulic fluid is quite volatile itself. So, if you spring a leak, there are many instances where that fluid has caught fire and machinery is lost as a result,” he said. Some designers may incorrectly believe that their hose is tough enough and additional hose protection products aren’t necessary. But Pawluk was quick to counter this line of thinking. Safeplast uses a high-density polyethylene for their wraps and the company has a unique production method for creating the spiral wrap. One of the interesting parts of the color aspect is that the company can produce dual color wraps—one color on top of another. This is critical for some customers for picking out problems before they occur. If the operator starts to see, for example, yellow starting to bleed through the black wrap, he knows that’s his pressure point. Maybe he can fix it before it becomes a problem. Colors in general are also helpful from a safety aspect, as it can make otherwise dark hoses that may be temporarily stretched across a floor much more visible. What is burst pressure for a hydraulic hose?